There are many different types of employees at the university. The guidelines below are for hiring a regular staff member, either full or part time. Hiring postdoctoral associates and temporary employees have different processes to follow. Have you submitted and had approved an Authorization to Hire form? Is a position control number (PCN) already available with the appropriate classification or do you need to reclassify a vacant PCN or create a new position? Your job will automatically be posted on Higher Ed Jobs and the Courier Journal. Looking for more options? Use our Diversity Resource listing as a guide to help you reach more applicants! The hiring process for a new employee follows multiple steps from start to finish. 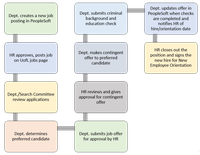 After determining the PCN is properly classified and approvals have been received, the job hiring process will begin in PeopleSoft. Follow the steps in the Recruiting Solutions Manual (PDF) to create the job posting. Department users must have attended training to be given access to Recruiting Solutions. To request training, please contact Employment Services. The following salary guidelines are for new appointments. Promote hiring at market value, consistent with job related qualifications. Delegate salary authority to department chairs & directors from salary range minimum to mid-point. Provide for HR review and require Dean/VP approval above range mid-point to maximum. New Employee Orientation is held every Monday in the Human Resources Department, or on Tuesdays when the preceding Monday is a holiday. All new employees are required to attend. For staff hires, your employment coordinator will sign the new employee up for a session when the position is closed out. Please refer your new employee to the New Employee Orientation web page for additional information about where to go, what to bring, etc.